If you do not remember the name of your wireless network, you can use your computer, tablet or mobile device to verify which network it is connected to. Your TCL Roku TV can connect to the same network. *If you do not have another device you can use to validate, you can refer to your ISP (Internet Service Provider) or router manufacturer's website. 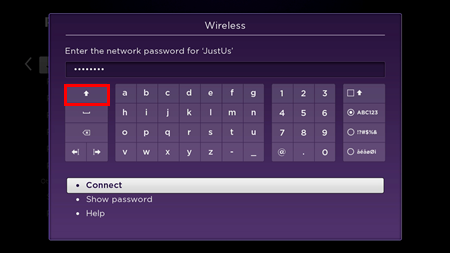 Also, you may find the default SSID on the bottom of the router. 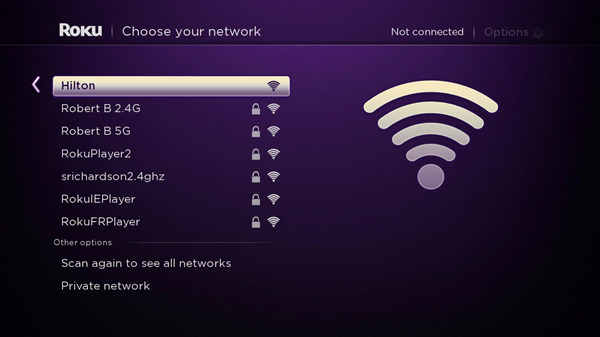 If you do not see your network name on the list, scroll down and select Scan again to see other networks. This should display all available networks. Click here if you still cannot see your wireless network. Enter the same wireless password you use to connect your computer, tablet or mobile device to your home network. *If you do not remember the password of your wireless network, you can refer to your ISP (Internet Service Provider) or router manufacturer's website. They can provide recommendations on how to recover the wifi password or possibly reset it. Sometimes the default password is listed on the bottom of your router. Tips: Passwords are case sensitive - to enter capital letters, you need to use the shift key on the on-screen keyboard.